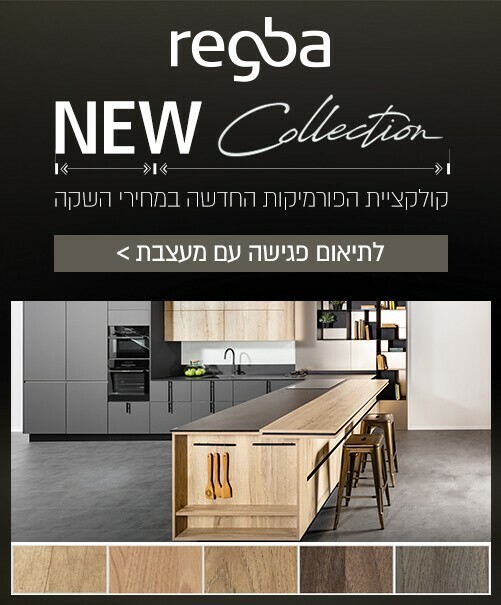 Regba is a leading brand name in designing, manufacturing, and marketing kitchens in Israel since 1964. The company comprises an ultra-modern 12,000 square meter manufacturing plant, and 16 show rooms located in major towns throughout Israel. Regba has opened as well, a consultancy center for architects and contractors to deal with large scale orders. The Regba manufacturing plant operates with the most up-to-date machinery available in the world, for carpentry and kitchen production. Our professionals plan, design and create Regba kitchens using cutting edge technology and methods. Thanks to meticulous planning, expert manufacturing skills, and strict quality control standards, Regba kitchens are the most sought after brand in Israel. The Regba show rooms are modern and spacious in order to adequately display our latest designs with a staff that offers attentive and professional service to all clients. Our company is ISO 9001-2008 certified and has an Israeli Standards Institute credential. Regba offers its clients 6 years of guarantee and a lifetime of service for all its products. Regba's functional and contemporary designs come in a wide range of styles. Each year the company presents a new collection, with complementary items and accessories such as faucets, fixtures and worktops that contribute to make our designs beautiful, practical and user friendly. Regba is constantly learning, developing, and implementing state-of-the-art technology and the latest trends into proven methods and designs. At Regba we offer a wide variety of designs, from which customers can easily choose the kitchen that best fits their dreams, expectations, and way of life. Aside from kitchens, Regba is well known for its bathroom cabinets and bedroom closets. Regba's quality standards and excellent workmanship is clearly present in their designs. Here too, one can find accessories, electrical appliances and much more, in accordance with the company's 'Total Service' philosophy. Regba is an integral part of thousands of homes throughout Israel.